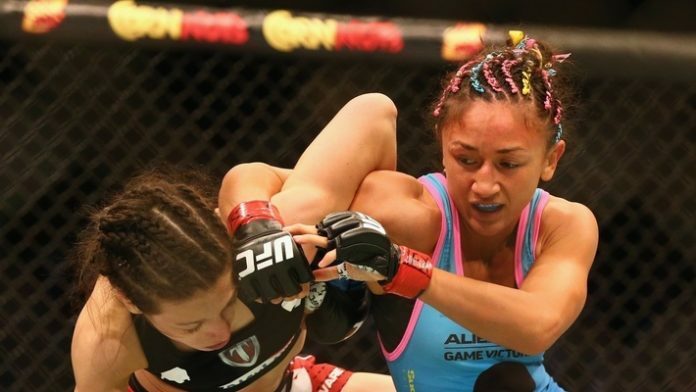 Carla Esparza believes her experience will play a factor in her bout with Tatiana Suarez. Esparza is coming off a split decision loss to Claudia Gadelha back in June. She had won two bouts in a row going into that fight. It was her first defeat since Feb. 2017. The inaugural UFC strawweight champion sits at the sixth spot on the official 115-pound rankings. Suarez has an undefeated professional mixed martial arts record of 6-0. In her last outing, Suarez submitted Alexa Grasso in the first round. She has three submission victories as a professional. Her bout against Esparza will be a significant step up in competition. Suarez holds the ninth spot on the official UFC strawweight rankings. In the main event of UFC 228, Tyron Woodley defends his welterweight title against Darren Till. The co-main event will see Nicco Montano put her women’s flyweight gold on the line against Valentina Shevchenko. You can count on MMA News to provide live coverage of UFC 228. Do you think Tatiana Suarez is ready to give Carla Esparza a run for her money?